ALMAHURST FARM, outside of Nicholasville, Jessamine County, Kentucky, is an extremely historic farm for both standardbreds and thoroughbreds. The Knight family had been breeding good horses of all kinds here since the mid-1800s. Grant Lee Knight bred the great trotting mare NERVOLO BELLE (foaled 1906) who is buried here. NERVOLO BELLE is the dam of PETER VOLO (sire of VOLOMITE; both father and son are buried at Walnut Hall Stud) and his full sister VOLGA. 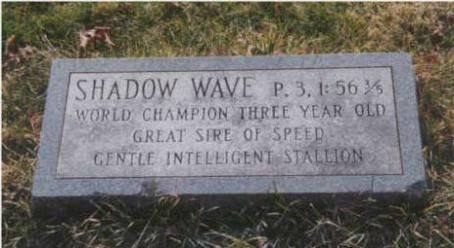 The World Champion pacing stallion SHADOW WAVE is also buried here (see photo). The early 20th Century thoroughbreds CLAUDE and EXTERMINATOR (1918 Kentucky Derby) were born here, as was the great grey trotter GREYHOUND (1932). Henry Knight became heir to most of the Knight land and in 1935 he named the property "Almahurst" for his wife Alma. Henry Knight bred thoroughbreds, including the important broodmare mare ALMAHMOUD (by *Mahmoud), granddam of both Northern Dancer and Halo, at the Lexington division of Almahurst Farm (formerly part of Coldstream Stud). After Knight died, the property was sold in tracts, the main one going to G. Burton Liese and renamed "Foxtale Farm." Another large tract was sold to S.A. Camp Farms, a standardbred operation that moved here from California, with the stallion BLAZE HANOVER, winner of the Hambletonian Stakes. In 1963, the entire operation was sold to P.J. Baugh. One of the leading standardbred breeders, top products include ARNIE ALMAHURST and FALCON ALMAHURST. In 1994, the property was purchased by Kenneth and Sarah Ramsey and renamed "RAMSEY FARM." -- A.P.